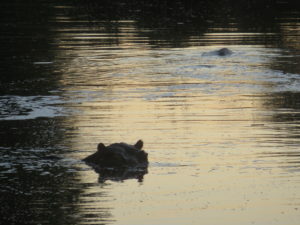 While at Kruger, we did as much wildlife viewing as we could. We got up at 5am. We went on night drives. We squeaked game drives in between conference sessions and dinner. The park is remarkable for its vistas and game. Though in May, it was also very dry. To me, the landscape looked munched down, despite the rainy season having ended just weeks ago. 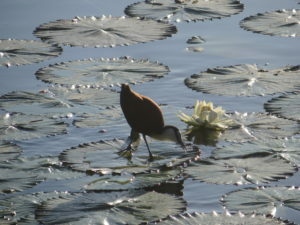 The park staff are predicting a tough year for wildlife as drought conditions persist. 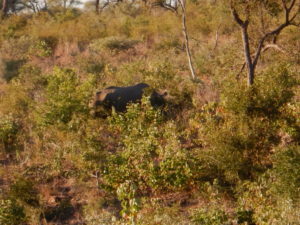 Rhino, the first animal we saw as we entered Kruger! 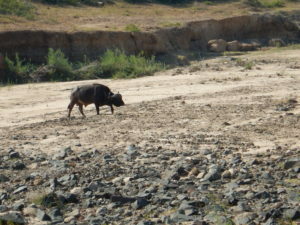 But the reason wildlife die during droughts is not usually because they are thirsty. 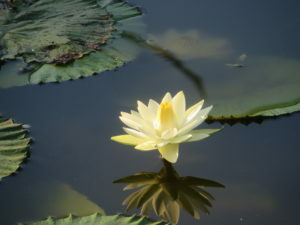 In fact many meet their moisture needs from plant foods and don’t need regular access to water in pools. What kills wildlife during droughts is starvation. Sparse rain means a lean year for plants, and low plant growth means a scant year for herbivores. 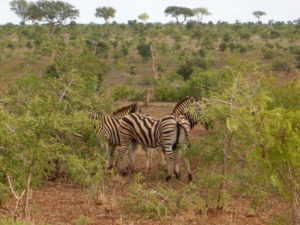 Everyone from impala to zebra to buffalo to elephants will be hungry. 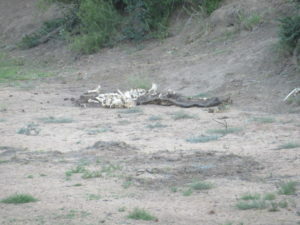 Remains of an elephant: some scattered bones and a gray hide. But drought years are good for carnivores. Lots of weak antelope makes catching easy. 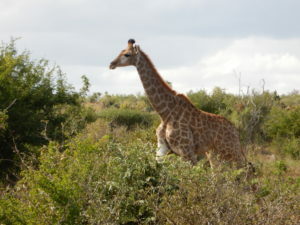 Lions, leopards, hyenas, wild dogs, cheetahs, vultures, and other carnivores live like kings when the landscape is dry. Some of these carnivores can go weeks without water, slaking their thirst on nothing more than the body fluids of their prey. 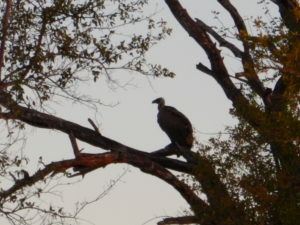 Vultures, members of Africa’s vital disease management and clean-up crew. With that cheery thought, we obviously stayed inside our vehicle when driving around the park. Though we did open the windows. It was too hot to keep them closed, and besides much of the experience is wrapped up in the smells and sounds of the park. 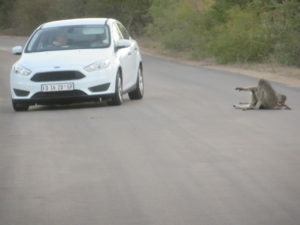 At Kruger, animals have the right of way. 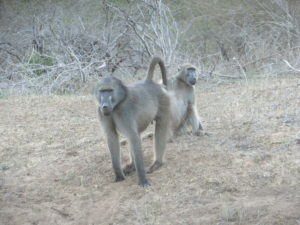 These baboons were enjoying the warmth of the tar road. 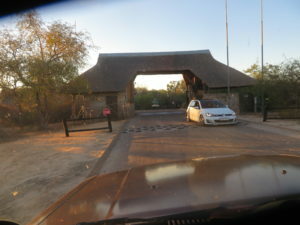 Most driving in Kruger is on tar roads – a change from Botswana sand. In some ways the tar is nice because it’s smooth and doesn’t choke you with dust. But it makes Kruger feel developed, managed, and fully documented. There is almost no chance your car will break down beyond the reach of help. You don’t need to carry your own toilet paper – it’s there in public toilets. There are public toilets! You can buy water at convenience stores. You can eat in restaurants. You can pitch your tent on grassy campgrounds. Basically, you can show up to the park with almost no preparation. And the park sets curfews that require all visitors to be safely tucked up in fenced camps at night. 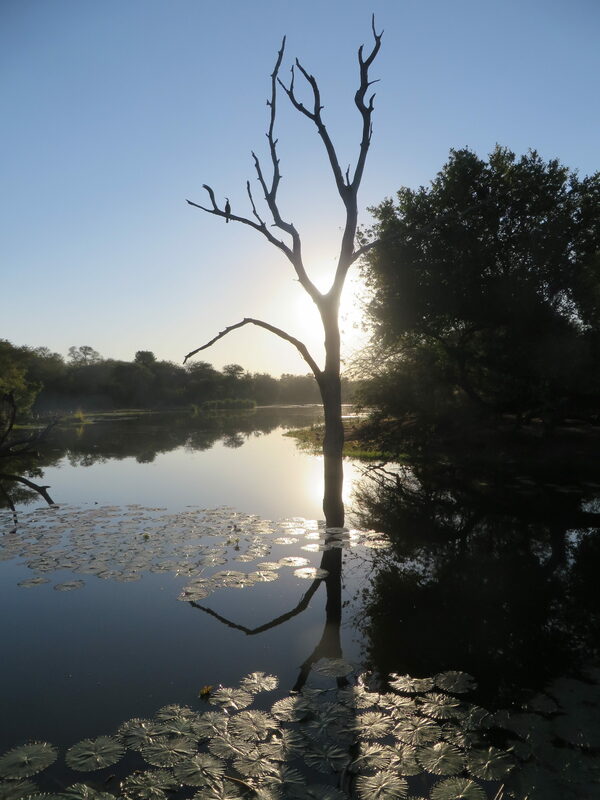 In a nutshell, Kruger is a great place to see game, but, because of all the safety and comfort, it’s a stretch to call it adventure. 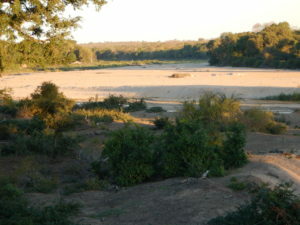 A dry river bed in Kruger. 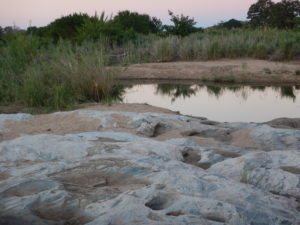 A Kruger river with it stones and grasses. 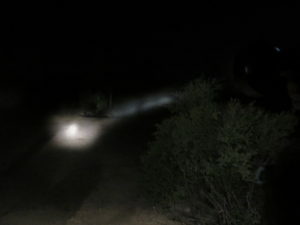 One of our night drives (which you can do with park staff) was particularly fruitful for seeing nocturnal beasts that would never come out in the light of day. 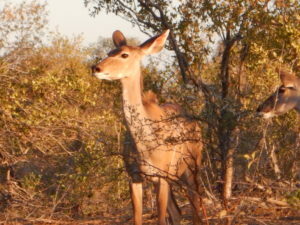 We saw a civet, a genet, a honey badger, spotted hyena, baboons, rhino, a giant rain spider, and (of course) impala. On an night drive. 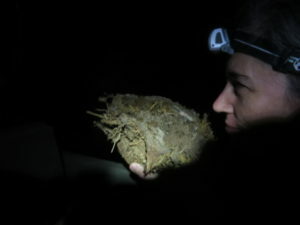 Elephant dung – it smells like cut grass. Poor impala – they are so numerous that the frequent game tourist actually gets tired of seeing them – the way people in Texas get tired of seeing cows. 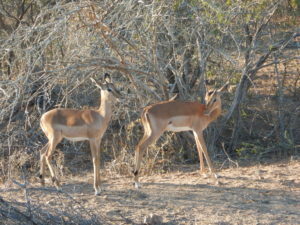 Maybe “tired” is the wrong word – because impala are very beautiful. It’s just that you see them so often, day and night, that the excitement wears off. 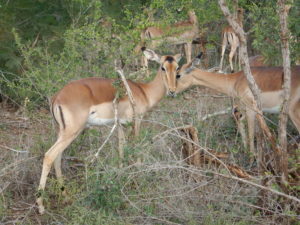 But I love impala and am grateful for their abundance in a landscape where many species struggle. Impala – delicate and tawny, easily identified from their black ankle socks. I want to point out that the night drive was only fruitful because one of the guests (sadly not me) was extremely good at seeing wildlife hiding in the trees. The guide was not helpful. He drove at a speed not compatible with identifying glowing eyes in the beam of our spotlight. As we zoomed by, we strained to catch glimpses of nighttime fauna as they flashed across our vision. Most of the time it was hard to tell if we’d seen something, or was it a product of wishful imagination? Only the most obvious sights were pointed out by the guide. The troupe of 100 baboons climbing a rock face. A scrub hare bounding across the road. 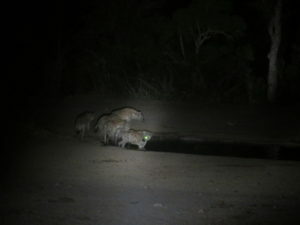 The pack of hyenas cavorting at a watering hole. The stoic pair of rhinos sipping water by moonlight. 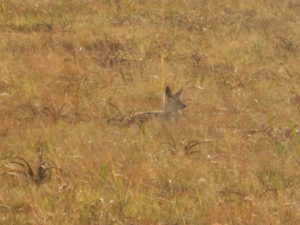 Even the hyena loping along the side of the road would have been missed if not for a watchful tourist. 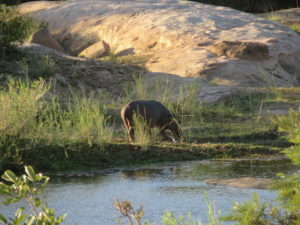 During the day we saw giraffe, lone buffalo, water buck, Egyptian geese, wildebeest, monkeys, warthogs, kudu, guinea fowl, franklins (quail-like birds), hippo, crocodiles, baboons, lilac breasted rollers (a beautiful iridescent bird), rhino, jackal, elephant, hornbills (also a bird), dung beetles, old tilapia nests, a goliath heron, marabou storks, jacanas (lilly trotters), black crakes (another type of water bird) and tree squirrels. 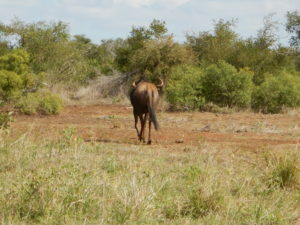 A lone wildebeest. Likely a male who lost his bid to lead the breeding herd. 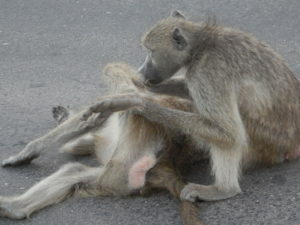 Grooming baboons enjoying warmth of the road. 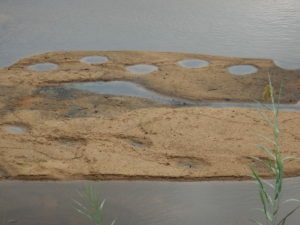 Old tilapia nests form circular depressions in the sand. 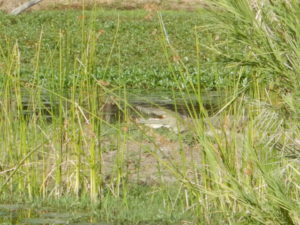 The video above shows a black crake foraging for lunch. 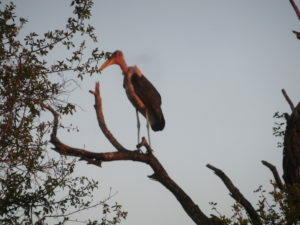 Marabou stork – the “old man” of southern Africa. The elephants were surprisingly elusive. Our friend, Pete, who has worked in the park for several field seasons, assured us we would see so many elephants that only impala would beat them in frequency. But not so. Not a single elephant in five days. 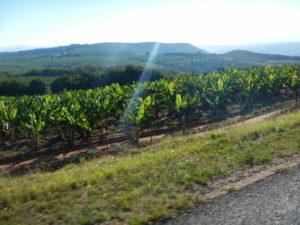 On our last day, as we departed Kruger, Pete took us on one of his favorite drives. “We’ll find elephants”, he promised. And at the edge of the park, in the nick of time, we found them. 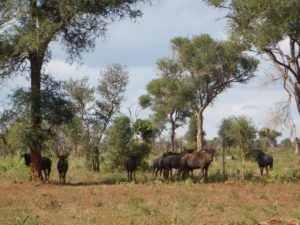 A herd of about 12. 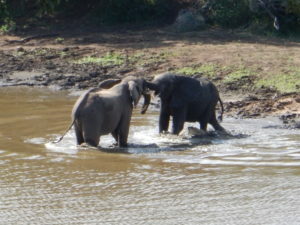 These were the first elephants my husband Brandon saw in Africa. 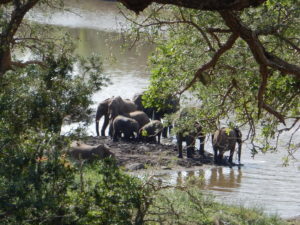 The elephants crossed the river below us, playing and tussling, drinking, and splashing. 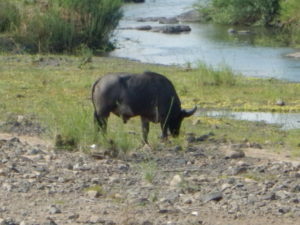 There were calves and young adults and matriarchs. The big male stood off a little way. 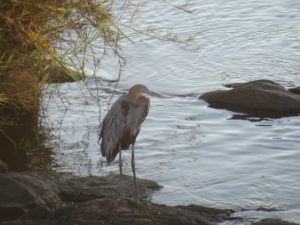 Further down river was another lone male. After about 15 minutes, the family group moved out of the water and made their way up the bank into the trees. They passed by our parked car, following the contour of the hill in front of us. We held our breath. Despite their enormous size, they walked almost silently. The only sound was the swishing of trunks and the tearing of leaves as they fed. They melted into the woodlands and vanished. We dragged ourselves away from Kruger, reluctant to leave this wild place to return to highways and factories, vast farms, and towns. 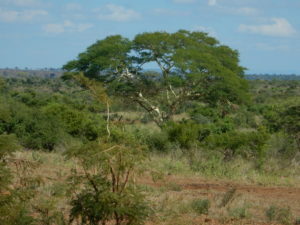 As you leave Kruger, the scenery change is immediate. You leave the scrubby shrubby native landscape and enter a world of green banana plantations, cultivated fields, burgeoning suburbs, and people. Lots of people. It’s a bit of a shock. 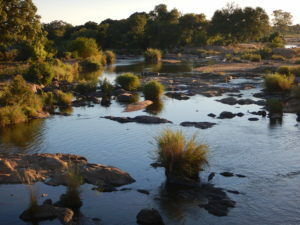 Kruger river with its stony shore. 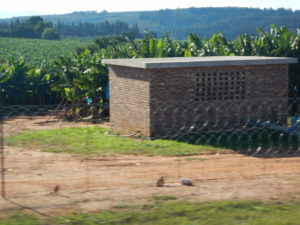 Where your bananas might come from.